Context: The role of percutaneous coronary intervention in the treatment of multivessel coronary artery disease (CAD) is still controversial and widely discussed. Aim: The aim of this study was to examine the incidence of clinical outcomes after utilization of Indolimus, biodegradable polymer coated sirolimus-eluting stent (SES), in multivessel coronary stenting in an unselected patient population. Settings and Design: From April-2012 to June-2014, patients with multivessel (≥2 vessels) disease were examined in the retrospective, nonrandomized, observational, multicenter MULTIDES study. Materials and Methods: A total of 151 patients, exclusively treated with Indolimus SES in multivessel, were included in the study. The study was conducted in accordance with the Declaration of Helsinki and country-specific regulatory requirements. All patients signed informed consent form. Statistical Analysis Used: Continuous variables are presented as mean ± standard deviation and categorical variables as counts and percentages. All data were analyzed using Statistical Package for Social Sciences program. Results: The mean age was 53.7 ± 10.7 years; male gender represented 108 (71.5%) patients. 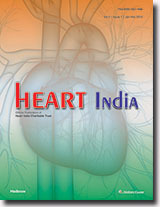 A total of 314 Indolimus stents were implanted. 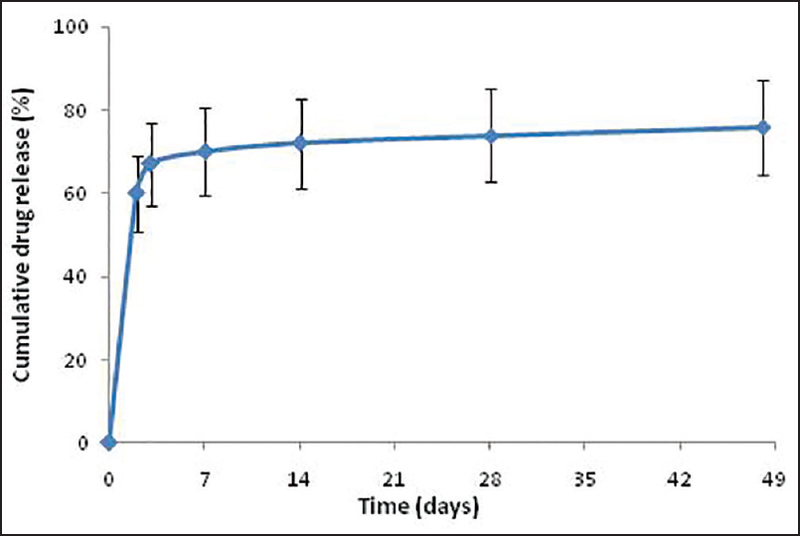 Clinical follow-up was performed at 30-day, at 6-month, and at 9-month. The primary endpoint, major adverse cardiac events (MACEs) at 9-month follow-up, occurred in 5 (3.3%) patients, consisting of 1 (0.7%) cardiac death, 2 (1.3%) myocardial infarction, 2 (1.3%) target lesion revascularization, 0 (0%) target vessel revascularization, and 0 (0%) stent thrombosis. Conclusion: The present study describes that Indolimus implantation is safe and effective treatment in multivessel CAD, showing low rates of MACEs during 9-month follow-up. Background: Revascularization strategy in acute coronary syndrome is based on the ST segment deviation in the presenting ECG. ST segment elevation denotes total occlusion of culprit vessel and mandates early revascularization. Aim: To study the correlation of totally occluded coronary vessel with ST segment elevation in presenting 12 lead ECG. Material and Methods: The present study was conducted in 89 consecutive patients with chestpain and angiogram evidence of at least one totally occluded epicardial coronary vessel. Culprit artery prediction was attempted according to the available algorithms and correlated with the angiogram finding. Results: Out of 89 cases 47 patients had left anterior descending artery (LAD), 27 had right coronary artery (RCA) and 15 had left circumflex artery (LCX) as culprit vessel. 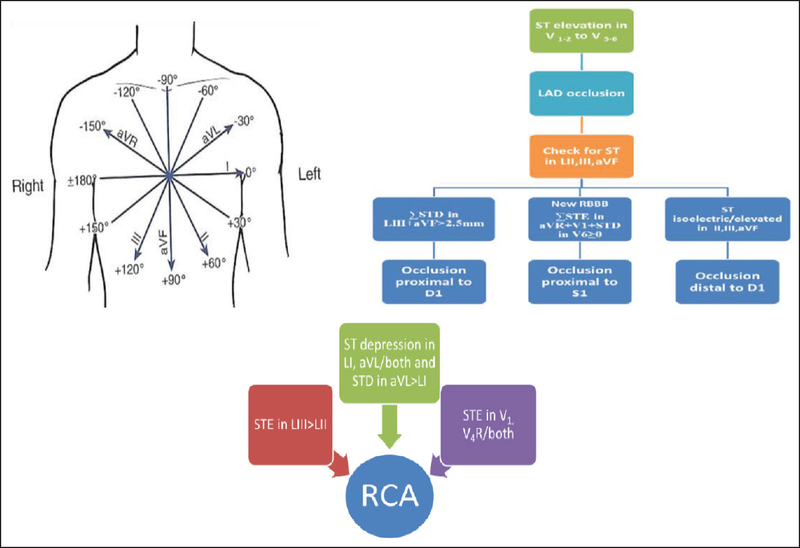 All patients with total occlusion of LAD and RCA had ST segment elevation, while only 50% of patients with circumflex artery occlusions had classical ST segment elevation. Conclusion: In our study we found that half of total circumflex artery occlusions were classified as non-ST elevation acute coronary syndrome when using the current 12-lead ECG criteria. This emphasizes the need for the incorporation of routine posterior leads in cases of suspected acute coronary syndrome if classical ST elevation is not present in 12-lead ECG .Otherwise many patients with totally occluded culprit arteries may be denied, the revascularization procedures in their golden hour. Background: Noncommunicable diseases are increasing and constitute a serious concern, accounting for 52% of the deaths and 38% of the disease burden in the World Health Organization (WHO) South-East Asia Region. Eighty percent of total deaths due to noncommunicable diseases occur in the low-income countries. Lifestyle changes are resulting in an increased risk of cardiovascular diseases (CVD). Surveillance of CVD risk factors is a key to reduce the burden of CVD. WHO–International Society of Hypertension (ISH) 10-year risk prediction charts have been developed for the screening of CVD risk factors in different regions. The National Programme for Prevention and Control of Diabetes, Cardiovascular Diseases and Stroke (NPDCS) has also recommended the utilization of these charts for routine screening. The present study has used the WHO-ISH CVD risk prediction chart to assess the feasibility of utilization of this chart as a predicting tool of a CVD event. Materials and Methods: A cross-sectional survey was conducted among supporting staff of JSS Hospital, Mysuru, Karnataka, India to assess the CVD risk factors and risk factor profiling, and the prediction of 10-year risk for CVD was done using a WHO-ISH risk prediction chart. Results: A total of 900 supporting staff were screened for CVD risks. Out of them, 30 (3.3%) had hypertension, 20 (2.2%) had diabetes mellitus, 18 (1.99%) consumed tobacco. The proportion of newly detected diabetes cases was 8 (0.9%) and of prediabetics was 32 (3.7%). The proportion of newly detected prehypertensives were 292 (39.08%), and 27 (3.61%) were hypertensives. Out of 175 individuals aged above 40 years, the WHO-ISH risk prediction chart predicted that 1.7% of them had >10% risk of CVD event within 10 years. Conclusion: Hidden, asymptomatic individual of diabetes, and hypertension were identified; the WHO-ISH 10 year risk prediction chart was easier for assessing the CVD risk factors and risk grouping, and could also be used to show them the extent of risk and predicting their 10-year risk of stroke or myocardial infarction (MI). Background: The role of glycosylated hemoglobin (HbA1c) in predicting the outcome of acute coronary syndrome (ACS) remains largely controversial. Much lesser is known of its importance in nondiabetics. Herein, we conducted a study to seek the association between the levels of HbA1c and the clinical outcome in nondiabetic patients who presented with ACS. Objective: The objective was to determine the impact of HbA1c levels on the severity and complications of ACS in nondiabetics. Materials and Methods: This observational cross-sectional study included 100 patients without diabetes mellitus who were admitted to the coronary care unit with symptoms suggestive of ACS. The diagnosis of ACS was made on the basis of troponin T value, electrocardiogram (ECG), and echocardiograph. Patients were stratified according to their HbA1c into two groups: Group 1 HbA1c <5.6 (36, 36%), Group 2 HbA1c between 5.7 and 6.4 (64, 64%). Main outcome measures were ECG changes (ST-segment elevation myocardial infarction or non-ST-segment elevation myocardial infarction), troponin T value, regional wall motion abnormalities and left ventricular ejection fraction on echo, along with the complications such as heart failure and arrhythmias. Data were analyzed separately using multiple regression analysis. Results: The mean age of patients was 58.67 years out of which 69% were males and 31% females. Of the total, 28% were smokers, 33% were known to be hypertensive, 32% had dyslipidemia, and body mass index was ≥25 kg/m2 in 9% of the subjects. The findings of this study found that increased levels of HbA1c were in general, associated with poorer outcomes in the nondiabetics. Conclusion: HbA1c is a predictor of major adverse outcomes in ACS in patients even when they are nondiabetics. Measurement of HbA1c levels may improve risk assessment in such patients when presenting with ACS. High altitude pulmonary edema (HAPE) is a life-threatening condition occurring at heights above 2500 meter mostly within 2-4 days of entry in high altitude. Postmortem studies showed evidence of thrombi in cases of HAPE suggesting possible role of thrombosis in the pathogenesis of HAPE. Here, we are presenting the two cases of HAPE with pulmonary embolism, and the possibility of pulmonary embolism should be considered in cases of HAPE with persistent radiographic opacities despite oxygen or descent. 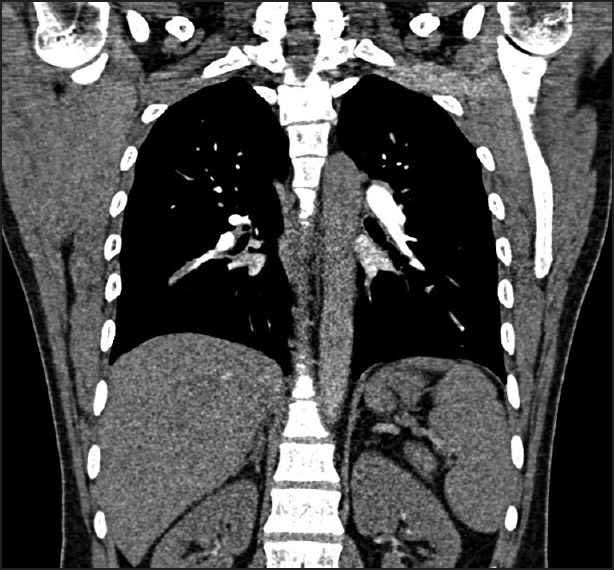 A 15-year-old boy was evaluated for the new onset of dyspnea. He had no significant medical or surgical history. On echocardiography, he was found to have a direct communication between the left ventricle and the right atrium through the atrioventricular (AV) septum (a rare type of Gerbode defect) with an associated cleft in the anterior mitral leaflet. The combination of direct type Gerbode defect with the cleft of the anterior mitral leaflet is extremely rare. Ocular myasthenia gravis is an autoimmune disorder of the neuromuscular junction. Diplopia and ptosis are common symptoms at the onset of ocular myasthenia gravis. It may occur due to the antibodies developed against various drugs. We are reporting a case of ocular myasthenia gravis which was developed in a patient post angiography which may be due to antibody developed against the dye used in angiography. Chest trauma has a high rate of mortality. Coronary dissection causing myocardial infarction (MI) following blunt chest trauma is rare. We describe the case of an anterior MI following blunt chest trauma. A 39-year-old male was received in our hospital following a motorcycle accident. The patient was asymptomatic before the accident. The patient underwent craniotomy for evacuation of hematoma. 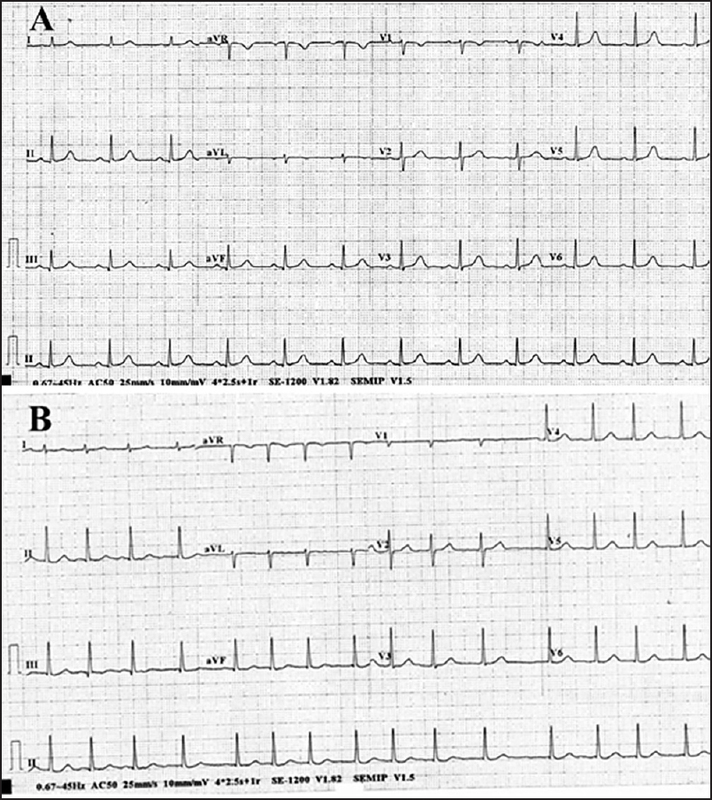 He developed severe chest pain and an electrocardiogram (ECG) revealed anterior ST segment elevation following surgery. Acute coronary event was medically managed; subsequently, coronary angiogram was performed that showed dissection in the left anterior coronary artery, which was stented. Coronary artery anomalies are rare, but still rarer is anomalous branching pattern of the left coronary artery (LCA) alone, without any congenital anomalies. 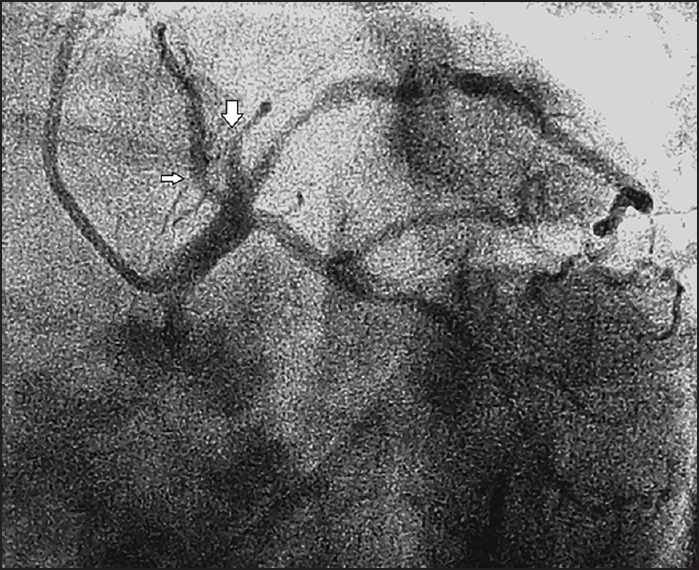 We report the case of a 50-year-old man who presented with dyspnea on exertion New York Heart Association (NYHA) class II, had a positive stress test, and his coronaryangiogram revealed the left main coronary artery (LMCA) dividing into four branches. This type of branching pattern is quite rare. He had type I dual left anterior descending (LAD) artery in addition to a fairly large ramus intermedius (RI) and a nondominant left circumflex (LCx) arising from the LCA. Awareness and recognition of dual LAD is of importance to surgeons and interventionalists alike in planning the revascularization strategy.